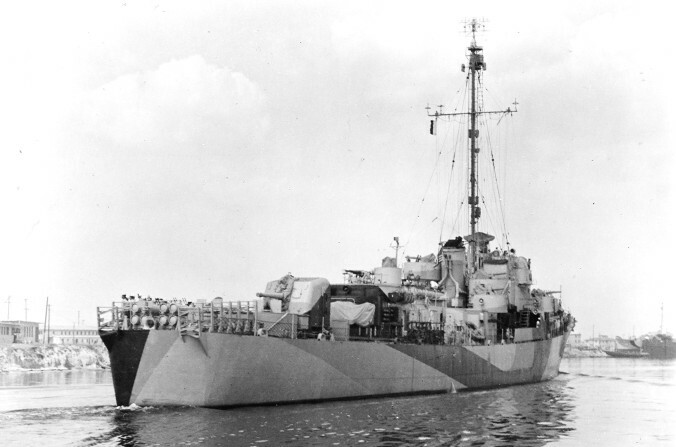 A port view of USS Douglas A. Munro (DE-422) near Houston, Texas painted in camouflage 31/14D on July 16, 1944. 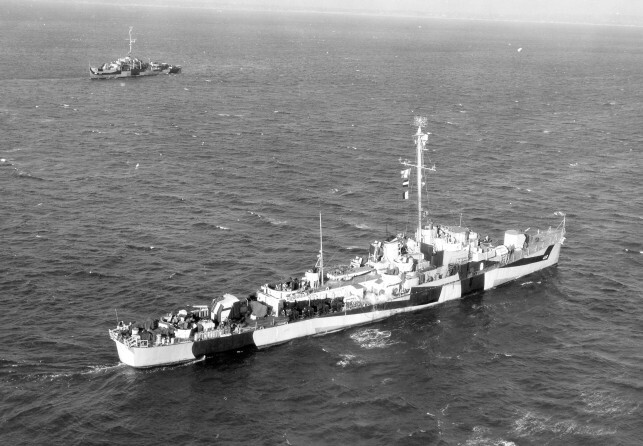 Douglas A. Munro was commissioned on July 11, 1944. Photo source: NARA BS 132144. Douglas A. Munro from the starboard bow in a commissioning portrait near Houston on July 16, 1944. Photo source: NARA BS 132145. USS Douglas A. Munro (DE-422) in three-color 31/14D on July 16, 1944 at Houston, Texas. Photo source: NARA BS 132147. 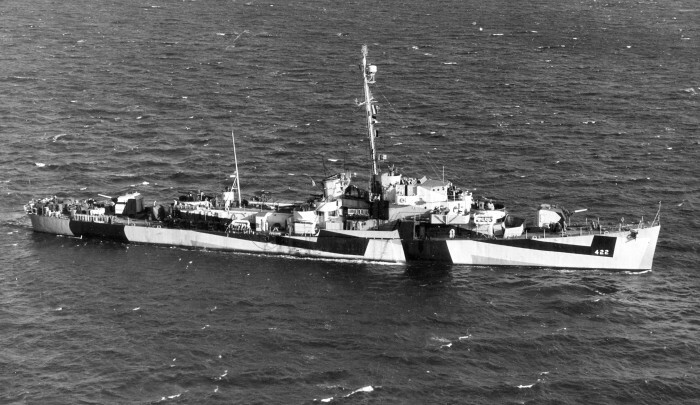 USS Douglas A. Munro (DE-422) photographed outside of New York on December 3, 1944. Munro is now wearing 32/3D and has a short mast with HF/DF but retains the torpedo tubes. 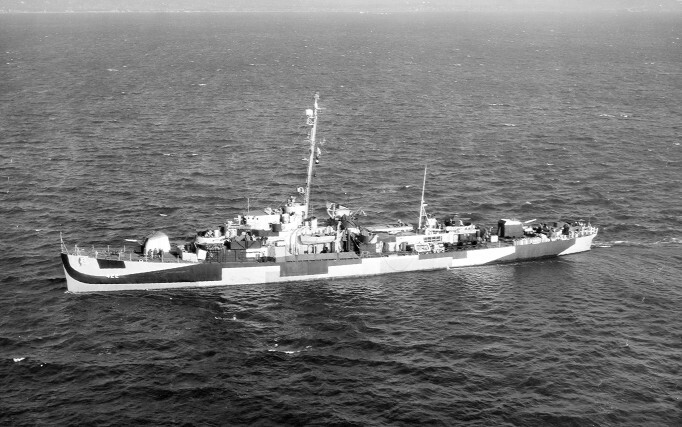 A port aerial view of Douglas A. Munro near New York painted in camouflage 32/3D on December 3, 1944. The dark area on the bow deck is probably due to shadow and not a deck pattern. 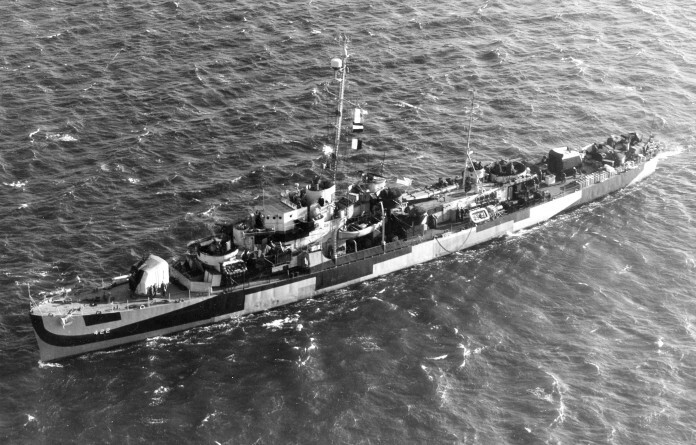 Douglas A. Munro from the port in another aerial shot near New York on December 3, 1944. Photographs in this series were taken by an aircraft from the Naval Air Station, New York. Photo source: NARA BS 75268. 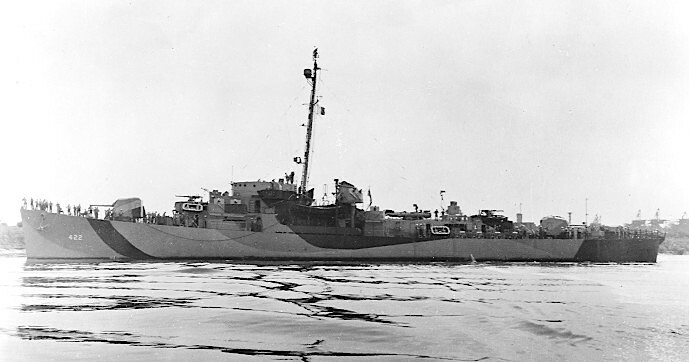 Douglas A. Munro again outside of New York wearing 32/3D on December 3, 1944. There is no evidence of a deck pattern from this view. 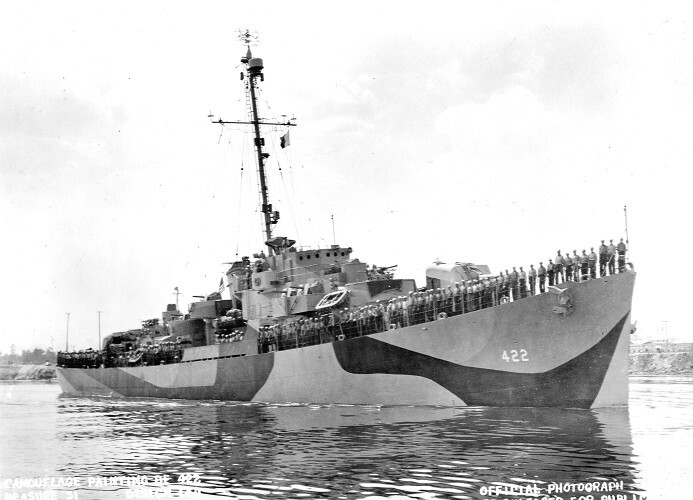 USS Dufilho (DE-423) is in the background also in 3D. Photo source: NARA BS 75270. Douglas A. Munro again in the last photo of this series outside of New York wearing 32/3D on December 3, 1944. 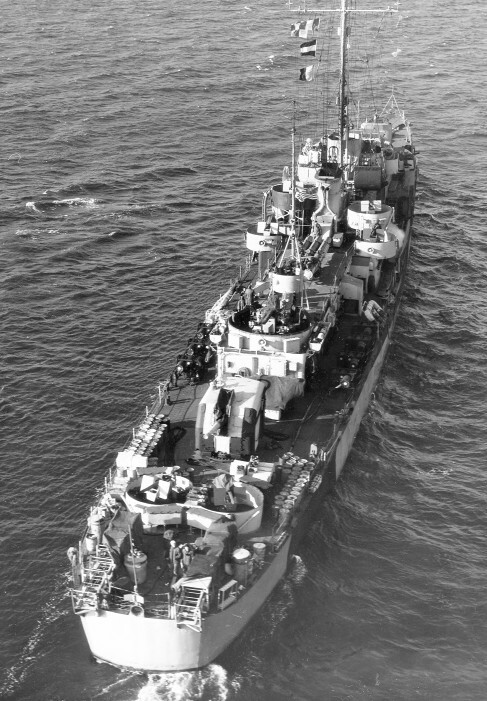 The depth charges are arranged on the deck and the smoke generator cylinders have been removed from between the depth charge racks. What appear to be trash cans alongside of the racks may be another type of smoke generating system. 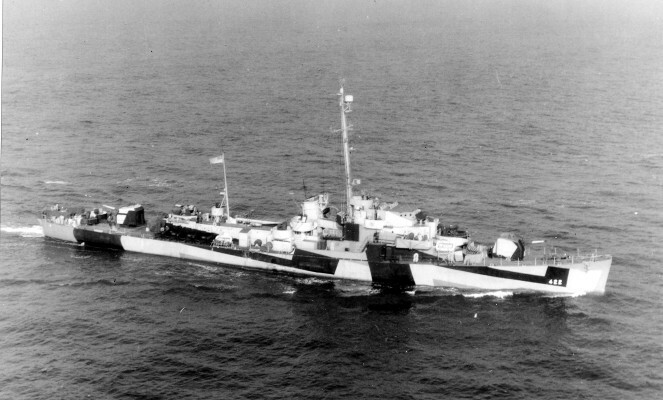 Douglas A. Munro photographed in the Gulf of Mexico by ZP-24 on December 7, 1944, again wearing 32/3D. Douglas A. Munro was on the way to the Panama Canal and then the Pacific.